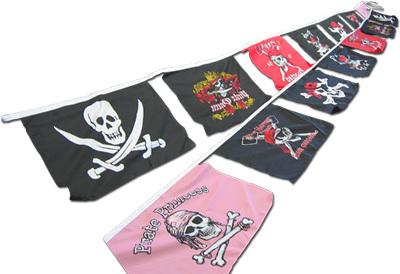 13 different Pirate designs make up our colorful polyester string banner. They are perfect for themed parties of all occasions, or use as general decoration to bring out the pirate in you! Each flag is approximately 11.5"x18" in size, with 3" inbetween each design and an extra 35-36" of string on either end for a total length of roughly 28.5 feet.